Issue: Wet ash disposal to dry ash storage. Coal powered generation facility silo. Coal powered generation facilities have to plan for disposal or reuse of byproducts, such as fly ash, created from the coal burning process. In its dry form, fly ash is vacuumed or blown into storage silos and used as a filler material in numerous market segments. 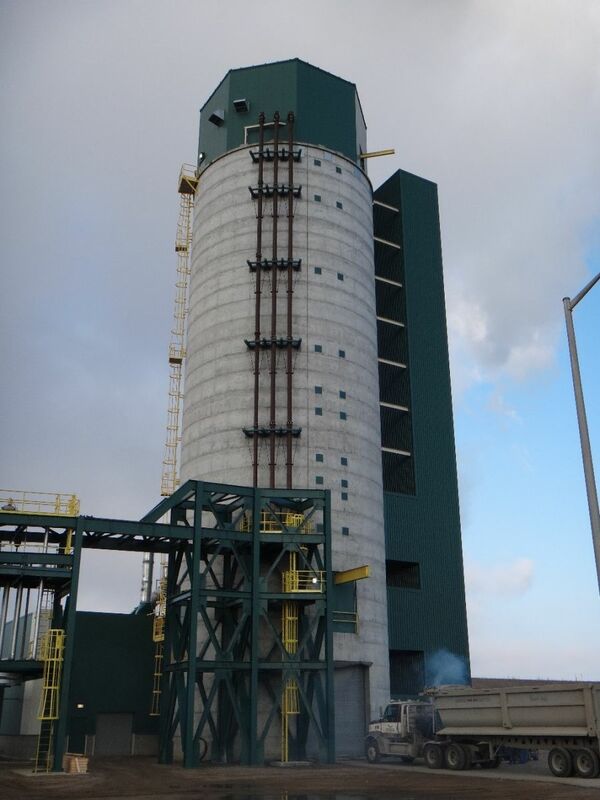 In the photo above the new fly ash silo constructed by Marietta Silos is finished. It includes a staggered external ladder with landings as a secondary means of access to the roof of the silo; equipment has been placed on the roof and the external electrical and piping systems traverse up the silo walls. The material handling equipment on the roof is enclosed in an inexpensive, sheet metal head house. This inexpensive method of enclosure protects the equipment from inevitable environmental conditions, increasing its longevity and operating efficiency.